Jack Flacco’s second installment of his Ranger Martin series, Ranger Martin and the Alien Invasion, begins where the first book of the series, Ranger Martin and the Zombie Apocalypse, leaves off…with Ranger chin-deep in zombie-mayhem, battling snapping, frenzied “death harvesters”, armed usually with his last few bullets, tenacious will, and a flair for last-minute improvisation and ingenuity. Lucky for Ranger, he’s also got a solid team of young, soulful, streetwise tagalongs guarding his back, keeping his heart open, and keeping him honest. Good thing, too…the man’s got a world to save! Ranger Martin and the Alien Invasion is a madcap ride, a rollicking read, that will keep you turning the pages well past bedtime. Flacco weaves a tapestry of imagery, dialogue and intrigue in his tale of zombie apocalypse and world’s end that I find endlessly compelling as a reader, and truly inspiring as a writer. To convey the dire nature of the state of a post-zombie apocalyptic world, a writer must be fearless when writing about death, gore, sorrow, and the darker, more sinister elements of humanity that emerge when the prognosis of life of earth becomes more and more grim. Flacco tackles these challenges like a champion. He is not afraid to dive in and get shoulder-deep in blood, tears, and slime green zombie gore. Ranger Martin and the Alien Invasion delivers, again and again, the kind of shots to the gut, and to the heart, that we zombie junkies need to feel the real. The action is nonstop, as Ranger and his crew keep finding themselves on death’s door, surrounded by insatiable flesh-eaters, and must rely on their wits, survival skills, and each other time and time again. In addition to the world being overrun with flesh-eating death harvesters (or chewers, rot suckers, decaying flesh rippers…Flacco seems to have a knack for coming up with endlessly entertaining new names for zombies, a trait I personally find quite admirable in a human being), Ranger and his can-do team of young rotslayers find themselves facing two other big (huge) problems: There seems to be an alien invasion happening, as our team of good guys are forced to dive for cover again and again to avoid detection by the hovering silver spheres of death, and the ungodly, deadly purple light that beams down mercilessly upon our embattled planet and the ragtag human survivors… and while one would think the government would have stepped in by now to shut this mess down, alas, there is a strong stench of goverment corruption and complicity in the highest ranks of both the military and country’s leaders. Flacco shows his skill as a writer and a storyteller as he weaves these fantastic elements together in a way that is enthralling, believable, and quite simply, unforgettable. 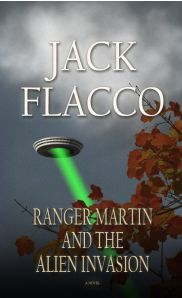 My favorite aspects of Ranger Martin and the Alien Invasion are all to do with the characters Flacco has created, and the human relationships and interactions between them. Flacco has an ear for dialogue, and the back and forth between these characters, and the challenges they face as they negotiate both the travails of a post-apocalyptic world and their relationships with one another, are quick-witted, at-times poignant and profound, and give the characters a depth and realism that bonds the reader to them.. Be warned, however… just because we connect to a certain character, it doesn’t mean they are going to survive in this dark new world. Flacco’s ability to create such strong characters, and make us open our hearts and minds to them (even if they may not be long for the story), gives Ranger Martin and the Alien Invasion a depth and complexity that lingers with the reader long after he/she puts the book down. Ranger Martin and the Alien Invasion is a real treat to read…I look forward to the next installments of the Ranger Martin series, and hope one day to see it on the screen, as I feel it would translate beautifully to either a television or movie series. Bravo, Jack Flacco, on a true feat of science fiction! Ranger Martin and the Alien Invasion comes out October 21, and is available on Amazon.